Top: This image from NASA’s Spitzer Space Telescope shows an infrared view of a sky area in the constellation Ursa Major. Bottom: After masking out all known stars, galaxies and artifacts and enhancing what’s left, an irregular background glow appears. 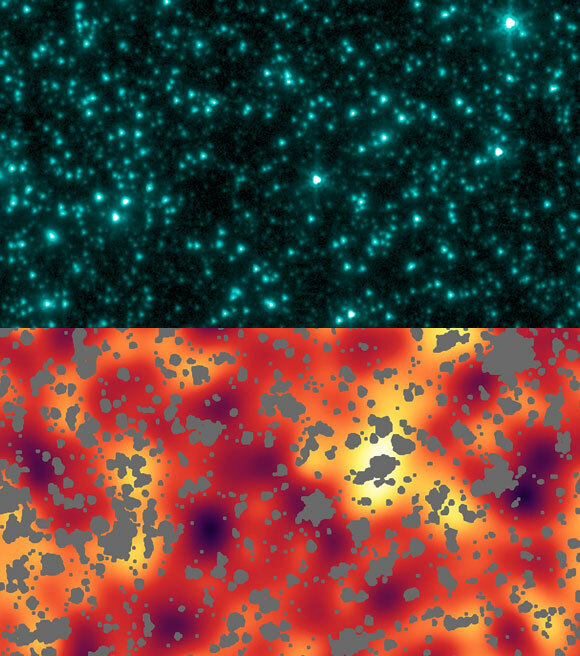 This is the cosmic infrared background (CIB); lighter colors indicate brighter areas. The CIB glow is more irregular than can be explained by distant unresolved galaxies, and this excess structure is thought to be light emitted when the universe was less than a billion years old. Scientists say it likely originated from the first luminous objects to form in the universe, which includes both the first stars and black holes. A newly published study from NASA’s Goddard Space Flight Center suggests a possible link between primordial black holes and dark matter. Primordial black holes, if they exist, could be similar to the merging black holes detected by the LIGO team in 2014. This computer simulation shows in slow motion what this merger would have looked like up close. The ring around the black holes, called an Einstein ring, arises from all the stars in a small region directly behind the holes whose light is distorted by gravitational lensing. The gravitational waves detected by LIGO are not shown in this video, although their effects can be seen in the Einstein ring. Gravitational waves traveling out behind the black holes disturb stellar images comprising the Einstein ring, causing them to slosh around in the ring even long after the merger is complete. Gravitational waves traveling in other directions cause weaker, shorter-lived sloshing everywhere outside the Einstein ring. If played back in real time, the movie would last about a third of a second. 9 Comments on "NASA Astronomer Reveals Possible Link Between Primordial Black Holes and Dark Matter"
Oh well, no accounting for logic…. I thought black holes had already been eliminated as a dark-matter contender? Black holes were one of the first ideas considered, then discarded, based on observations. Do we just throw out all the previous observations showing dark matter cannot be black holes? Black holes are the result of rotating charged bodies. The centers of gravity is the geometric venter of rotating mass. If the rotating masses are chatged, the rotating masses create currents and these circular currents create a magnetic B-field perpendicular to the plane and in the center. The center B-field is the strongest and can cause electric jets. V=(e/m)uI= 176G 1.25u Im/s = 220km/s at current I =1 amp. The faster rotation is not due to gravity or “Dark matter”, it is due to Electromagnetism and so-called Dark Energy”, cP, the vector energy! The Law of Gravity is described by Quaternion Space, not General Relativity. Quaternions quantities consist of a scalar and 3 vectors. This is the Quaternion Gravity Energy, Newton’s Energy is the scalar energy and cP=cmV is the vector energy. cP answers to the Dark Energy/Matter. If you really think about it, it makes total sense. Dark Matter is the residual crap that comes from the Black Hole eating object matter and energy. Though you will probably never be able to prove this due to not being able to see what comes out the otherside. Attention all planets of the Solar Federation! Think about it w/o superior intellect. We see massive gravitational in fluency of black holes, stop. We say that dark matter is transparent and exerts no force, yet explains the mass shortage. Ah hah!! Hello Sir! Massive objects need not always be opaque. You look at the masses of nucleons. Only Up and Down quarks are material but they account for only 10% of the known mass of them. Rest of the mass is hidden in the bosonic transparent nuclear forces called strong forces which is capable of creating more quarks than which it reveals. Again look at the weak electromagnetic forces called W+,W- and Z Bosons which are completely transparent but in radioactive decay they emit alpha particles (Helium Nuclei), Beta particles (electrons) which are all material in nature born out of these hidden bosons and the rest mostly emits again as the powerful Gamma rays. Mass and energy are the two sides of the same coin but the energy side is 96% of the Universe and yet they are transparent but pulls enormous gravitational force on your galaxies which are strewn apart at the speed of light. You don’t call it as very weak gravitational force but some unknown dark force enormous enough to sweep the material objects. So much so the Black Holes are exerting enormous force on the surroundings . We assume them to be collapsed galaxies and stars where only real physical appearance of objects of stars are diminished but the enormous 96% force unseen is enveloping it. Hence to relate black holes primordial to hitherto unknown dark matter is plausible, where the dark matter seems to be the origin of all the matter in the Universe and 96% energy hidden in them.Thanking You.